Researchers stop brain swelling at the source in animal model. A team of researchers have made a significant discovery in the mechanism of brain swelling, paving the way to preventative treatment for severe to fatal brain damage following stroke, head injury or cardiac arrest. The team state the their new study research paves the way for a preventative drug treatment for severe brain damage following stroke, infection, head injury or cardiac arrest. By turning off a single gene, scientists from the Djavad Mowafaghian Centre for Brain Health (DMCBH) were able to stop fluid from accumulating in rodent brain cells. The opensource study is published in the journal Cell. The team explain that brain swelling is a gradual process that becomes life-threatening days after the injury and is caused by an infusion of water and sodium chloride into the brain’s nerve cells. By identifying the mechanism behind the swelling, emergency physicians may in the future be better able to provide preemptive treatment, protecting the brain in the days that follow the initial trauma. The brain swells as the sodium chloride draws fluid into the nerve cells by osmosis. This swelling, known as cytotoxic edema, eventually kills brain cells. In the current study the researchers used a special microscope to watch the cascade of events that took place within individual brain cells as they swelled. They then switched off the expression of different genes and were able to pinpoint a single protein, SLC26A11, that acts as a channel for chloride to enter nerve cells. The team hypothesize that when the chloride channels are turned off, the accumulation of fluid is stopped. The team have developed several novel technological approaches to identify the cascade of events that took place within individual brain cells as they swelled. Previous studies have shown that sodium chloride accumulation in neurons is responsible for brain swelling, however, the current study shows how it’s getting into nerve cells, and presenting a new target to stop it from happening. To the team’s knowledge this is the first time anyone has been able to block its entry into the nerve cells. The researchers state that severe brain swelling is life threatening because the skull, which normally protects the brain, also limits its ability to expand. With increased pressure and nowhere to go, if the brain swells down towards the brain stem the centers that control breathing can be crushed. They go on to add that in cases where other treatment options fail, an operation called a decompressive craniectomy is sometimes performed where a portion of the skull is removed and the brain is allowed to swell out of the skull. Although extreme, it can save the patient’s life, but the procedure is not always effective, nor without complications. There’s an urgent need for new treatments. The team note that although the technique in the current study does not work quickly enough to mitigate swelling in the case of real head trauma, the discovery has provided a target for drug development. The researchers surmise that this discovery is significant, because it gives the medical community a target to inhibit the chloride channel and by doing so, inhibit the accumulation of fluid. Cytotoxic brain edema triggered by neuronal swelling is the chief cause of mortality following brain trauma and cerebral infarct. Using fluorescence lifetime imaging to analyze contributions of intracellular ionic changes in brain slices, we find that intense Na+ entry triggers a secondary increase in intracellular Cl− that is required for neuronal swelling and death. Pharmacological and siRNA-mediated knockdown screening identified the ion exchanger SLC26A11 unexpectedly acting as a voltage-gated Cl− channel that is activated upon neuronal depolarization to membrane potentials lower than −20 mV. Blockade of SLC26A11 activity attenuates both neuronal swelling and cell death. Therefore cytotoxic neuronal edema occurs when sufficient Na+ influx and depolarization is followed by Cl− entry via SLC26A11. The resultant NaCl accumulation causes subsequent neuronal swelling leading to neuronal death. These findings shed light on unique elements of volume control in excitable cells and lay the ground for the development of specific treatments for brain edema. 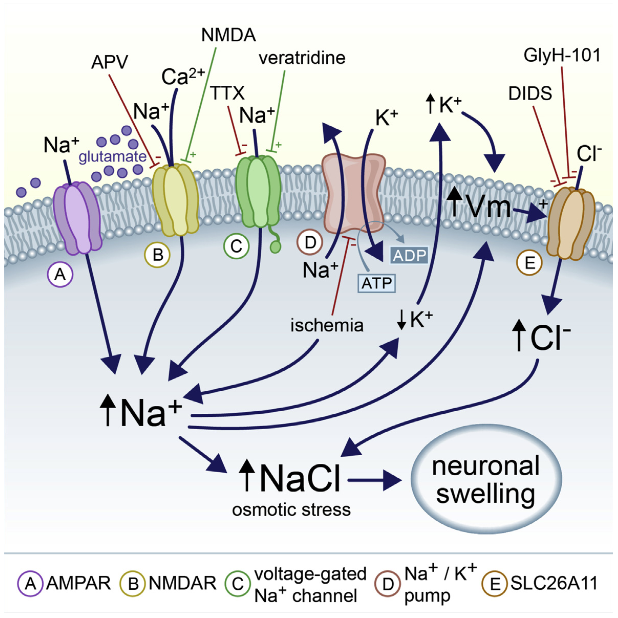 The Cellular Mechanisms of Neuronal Swelling Underlying Cytotoxic Edema. MacVicar et al 2015.